Do you want to add padding to your rug to make it thicker and more comfortable? Reilly’s Oriental Rug Cleaning can help; we offer rug padding services at competitive prices. With over a century of experience serving the residents in Northern New Jersey, you can trust us to deliver excellent services. If you have a favorite rug that you will like to improve, rug padding can make the rug more comfortable as well as extend its lifespan. Rug padding is the process of adding pads underneath the rugs to make them bouncier, as well as add a host of other beneficial attributes to it. When done by a professional rug padding company, rug padding can improve the look and feel of your rug. 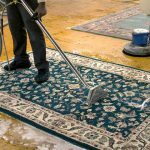 What are the Benefits of Rug Padding Services? Rug padding can help make your rug feel more comfortable by adding more “bounce” to it. Rug padding can also help protect your floor in case you have heavy furniture. Rug padding is important if you have a wooden floor which can be easily damaged by heavy furniture. Rug padding can also help reduce the possibility of slips, especially if you have a concrete floor or marble floor. Rug pads can prevent rugs from curling or bunching. This happens a lot, especially if the rug is placed on a hard surface such as a concrete floor. Pad can be attached to the rugs through adhesives. In this process, adhesives are applied into the felt rubber pads and the rug is then attached to the felt rubber. The rug is allowed to dry so that the felt rubber pads can bind firmly to the rug. The other approach to rug padding is to use heat presses. In this process, heat is used to bind the adhesive firmly into place. Heat pressing prevents the adhesive from damaging the fibers and this protects your rug. At Reilly’s Oriental Rug Cleaning, we offer high-quality services at very affordable prices. This is because we are a family-owned business with years of experience in cleaning, padding, and repairing rugs. Our family-owned status ensures that we are sensitive to your needs including budgetary concerns. Our prices are very competitive and you are sure to get great value for your money. When you come to us for rug padding services, you get the best of our 100 plus years of experience in this business. We also have state-of-the-art equipment that ensures that our work will be excellent. Our premises include purpose-built facilities such as a climate controlled dry room among other facilities. Are you interested in using Reilly’s Rug and Carpet Cleaning’s rug padding services? Do not hesitate to call 201-445-0800 or email us at Info@RugClean.net for more inquiries.